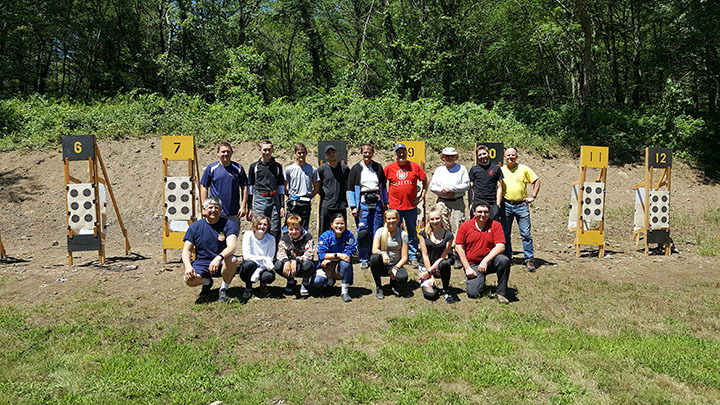 It was a gem of a summer morning, warm, light breeze, warm, and a bright sky, when Range Officer Brenda Jacob called the shooters to the line at the South County Rod and Gun Club for the prone stage of the 2017 Rhode Island Outdoor 3P NRA Regional and RIRRA State Championship. Using iron sight junior Rick Miller posted a 387-16X to edge out ‘scope shooters Bob Lynn, 385-18X, and Joe Graf, 382-10X for the win. Matt Lazarski was the best Expert with a 373-10s just a head of team mate Matt Jerome by a pair of center shots. Marksman Dave Czerwonka’s 373-8X was good enough to take his class while Kiera Ulmer bested all Unclassified Master with a 372.12X. Miller made it clear that his training plan was working when he won his second match of the day shooting a 379-11X standing. Lazarski was in second place as first Master with his 356-7X. ZuZu Demetrius topped the Expert class shooting 344-6X. Jack Eddy, 336-3X, and Devin Harris, 308, bested all in the Marksman and Unclassified Master classes respectively. Heading into kneeling, the final match of the day, Miller held a commanding lead and it was his match to lose. And, after a fashion, lose he did. Phil Kohanski came out of the pack and took the match with a four point lead over a pair of New Hampshire competitors, first Master Elizabeth Dutton and five points over Lynn. Miller, 361-6X, had to settle for Expert class honors. Marksman D.J Titus carded a 354-8X while Ulmer grabbed her second class win of the day. It came as no surprise that, after Statistical Director Nicole Panko tabulated the scores, Miller, at 1127-33X, was awarded the gold medal. Silver went to Elizabeth Dutton who compiled a 1093-26 aggregate. The bronze medallion went to Lazarski’ s 1090-22X while Czerwonka bested all Marksman with his 1040-12X. Ulmer was not to be denied a victory as an Unclassified Master. Graf retained the Epstein Trophy for yet another year while Titus earned his first state title.